Grapes are quickly becoming a popular fruit to grow in the backyard. Whether you desire the look of decorative bunches or the taste of the sweet, juicy treats, with over 20,000 varieties, there are now grapes that can be grown in nearly every climate. With a little extra care and attention to the growing process, you’ll be rewarded with elegant beauty and a taste that can’t be topped. There are many varieties of grapes and finding the one that matches your climate, soil and growing conditions is key. This one step can make or break your grape growing success. Consider insects that may eat the grapes and when they are most prominent. For example, if you have a large number of wasps in the fall, you will want an early-ripening grape. If you are unsure of what varieties will grow in your area, research online or visit a local vineyard and see what types they grow. If no one in your area grows grapes, it doesn’t mean that they can’t be grown. Do your research and choose a variety that best fits your situation. This should be an area that both air and soil drain away effectively. Many varieties of grapes are unable to handle the frost, so you want the cool air and water to flow away from your planting area. Sometimes this can be achieved by simply planting the grapes on an elevated area. Grapes prefer full sun, so find an area that has little or no shade. Grapes need rich soil to grow in. Before you plant, prepare the soil with plenty of organic matter, especially fish fertilizer. 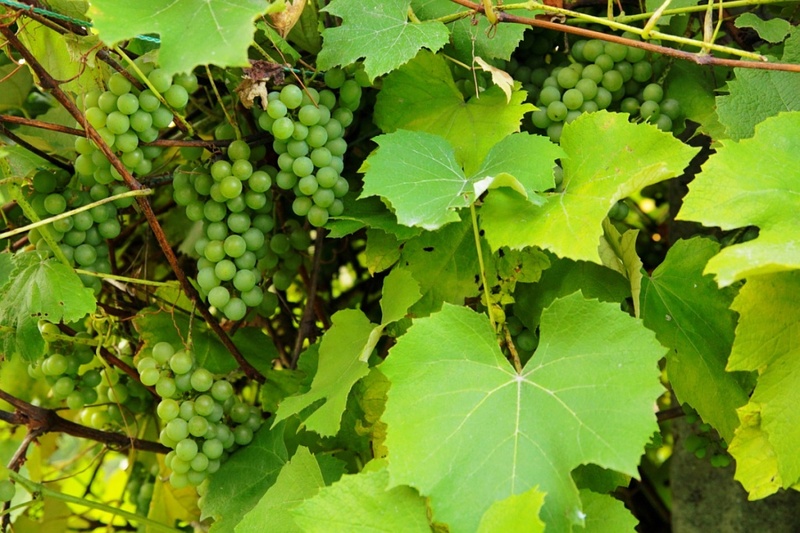 Avoid chemical fertilizers as they contain a high level of nitrogen, something that grapes don’t need. Some may choose to mix the organic matter into the soil, or you can lay it on top and allow the worms, soil and insects naturally mix the materials. When you have chosen a variety that meets your needs and is able to thrive in your area and you have prepared the soil, you are ready to plant your vine. Fortunately, planting grape vines is not difficult at all. Simply dig a small hole in the ground (try not to damage the structure of the soil any more than necessary) and insert the roots of the vine. Fill the remainder of the hole with the loose soil. Grapevines will need a trellis or other support for growth. You will need to train your vine by starting it straight up the trellis. Allow secondary vines to branch out further. It may be necessary to tie the vine to the trellis to start out with. Find out whether the variety of grapes that you are planting is self-pollinating. If it is not, you will need to plant a pollinizer nearby. A pollinizer is a plant that is planted nearby that provides the pollen necessary to produce fruit. After the first month, will need to water your grapevines during droughts only. Grapes do not require frequent waterings. Pruning your grapevines is the most important part of this “art.” Pruning allows you to manage the plant, regulate the size of the crop and adjust the quality of the fruit. Summer Pruning to Increase Fruit Growth: Trim back vines when they have exceeded 2-3 feet of growth. This directs the energy back into the fruit, rather than plant growth, making a sweeter, more productive crop. Fall Pruning: These prunings are not recommended and should only be done if you are sure there will be no warm spells that would allow growth before winter. Typically it is best to wait and do a winter pruning. Winter/Spring Pruning: Most plants are pruned in late winter to allow for new growth. The key to this is pruning early enough that new growth has not already begun and late enough that no new growth will form before a frost. If this happens, it will lead to freeze damage which is dangerous for your grapevines. It is often best to prune no more than one month before the last frost. Lateral shoots (those growing to the side) are not fruitful and should be removed. Only keep these shoots if you need them to grow onto the trellis for support. Prune new shoots way back the first few years to encourage growth of the main vine. Keep the first 6-12 buds on the cane, these produce the fruit, and trim back the rest unless they are needed for trellis support. Prune any brown or brittle buds as they have been winter damaged and need to be removed. Prune away enough of the vine to allow plenty of air and sunlight to reach the fruit and vines. Pruning is a detailed process, there are even books devoted to pruning grapevines. Here are some basic rules to get you started. Harvest your grapes when the grape at the bottom of the bunch is sweet. If some of the grapes are not fully ripened, they can be ripened by setting in the sun for a day or two. Grapevines make beautiful decorations. Use your trimmings to make wreaths or other decorative pieces. This is best done while the vines are wet and easy to bend. They will stiffen as they dry. Want to make raisins? Remove all stems and place the seedless grapes on a pan or screen in the sun. This will take several days, so watch out for animals and other critters. Move to a safe location, often inside, during the night and any rain.